I didn't believe it at first. 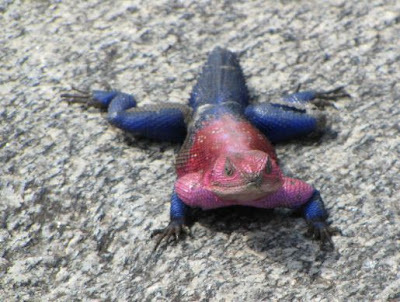 Is the Mwanza Flat-headed Rock Agama (Agama Mwanzae) for real? Does Spiderman really have a reptilian cousin? It seems that he does. This Sub-Saharan African lizard is becoming all the rage among pet owners. And even though I abominate fad pets (or rather, the fad itself), I must admit to feeling an urge to own one of these. Of course, it's only the male that sports such color. Show offs. Thanks for the fad lizard, Ida. so beautiful! Male animals are usually more interesting to look at than female animals. Peacocks and certain types of birds, for instance. It's all for mating rituals, in order to look beautiful to attract female partners. Very catchy color I agree. i think word thingy is actually a word!